Metallic Products’ adjustable louvers are built to ensure proper airflow into — and out of — your company’s metal buildings. Designed specifically for pre-engineered metal building wall panels, the adjustable louver features roll-formed blades with plated twin-link pivot brackets riveted to the blade and connected with ¼” zinc-plated rod. Its brass pivot bushings and durable build ensure smooth, noncorrosive and long-lasting operation. The standard operator for our adjustable lovers is the reinforced cast aluminum hand crank. Custom options are available, however, and the louver can be factory- or field-modified for chain operation or a motorized operator. This is especially useful in instances where a hand crank is not accessible. 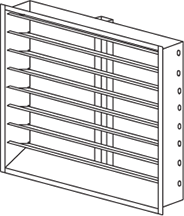 Metallic Products’ operable louvers feature blade edge seals for maximum air sealing. They feature 77% free area when opened to a full 90-degree angle. Louvers are self-mulling, self-flashing and self-framing. No other trim required. Louvers are chemically treated prior to painting. Louvers can be painted to match pre-selected colors by manufacturer. Standard paint is an electrostatically-applied powder paint, 3 mm thick with an oven-baked finish. After the paint process is completed, an extruded weather stripping is applied to the edge of each blade to ensure virtual air tightness in the closed position. NOTE: Please specify panel type when ordering. The frame has a recessed head to accept the wall panel and side flanges fit specified panel profile on 1’ modules. The sill is tapered to provide drainage and exclude moisture. Flat flange louvers are also available for installation into framed openings. All welds are watertight and made from non-corroding siliconized bronze wire and finished after fabrication. Additional materials available include stainless steel, aluminum and Galvalume. All louvers are shipped with an 18 x 16 aluminum insect screen mounted in a removable, rewireable frame. Hardware cloth is also available. Louvers are shipped individually in heavy duty cardboard cartons.